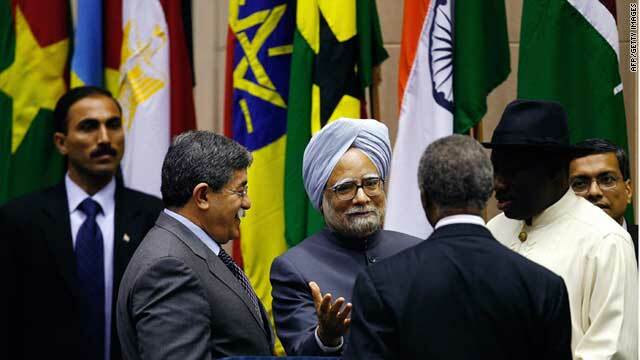 Indian Prime Minister Manmohan Singh speaks to African leaders during the first India-Africa Forum Summit in April 2008. Analyst says India wants to be seen to have "the best interests of Africa at heart"
(CNN) -- While China has been able to use its considerable economic clout to forge strong ties with Africa, experts say India is hoping that a mix of soft power and business expertise can win it friends and customers on the continent. Over the last few years, Beijing has struck deal after deal with African countries, often building extensive infrastructure projects and providing loans in exchange for access to natural resources, trade opportunities and expansion into new markets. Lacking China's deep pockets, analysts say India has often struggled to compete directly with Beijing, especially for natural resources such as oil and gas. As a result, New Delhi has embarked on a charm offensive as it bids to stay relevant on the resource-rich continent. Indian officials are keen to remind African leaders of their common past of anti-colonization struggles as well as offer India's expertise in areas such as information technology and human resources. It's all seen as part of India's effort to make itself an attractive partner, both politically and economically. "India is trying to position itself as an important geopolitical player in Africa," says Brahma Chellaney, a professor of strategic studies at the privately funded Center for Policy Research in New Delhi. "At the same time, it wants to be seen in Africa as a country that has the best interests of Africa at heart and is willing to play a more constructive and forward-looking role in Africa than China," he adds. Although China's engagement with Africa has brought benefits to the continent, such as improved infrastructure, China has been accused by some of resource plundering, poor labor practices and of supporting governments with poor human-rights records. Critics say Beijing has worked with dictatorships in countries such as Zimbabwe and Sudan. In copper-rich Zambia, state media reported in late 2009 that Collum mine workers "threw missiles" at Chinese managers after receiving "slave wages." However, India has had its share of controversy. It has also been active in Zimbabwe and ONGC Videsh, India's major oil and gas firm, has a 25% stake in the Greater Nile Petroleum Operating Company in Sudan. Nirmalya Kumar, author of "India's Global Powerhouses: How They Are Taking on the World," says that Indian politicians have lately observed there's been some backlash to Chinese investment in Africa. "Some Indian diplomats think that this is a good time for us to now go (to Africa) in a much more democratic manner, a much more concerned-for-the-population manner," says Kumar. India is turning to the one billion-strong continent in order to diversify its trade and expand its diplomatic relations. Alex Vines, head of the Africa program at think tank Chatham House, says that much of India's diplomacy in Africa is designed to get African support for a permanent seat on the United Nations Security Council. "That's one of the reasons India has over the years invested so heavily in contributing peacekeepers to U.N. missions in Africa," he says. "For example, there's still a significant number in the Democratic Republic of Congo, so that's all part of, kind of, Indian policy." The U.N. security council aspirations, the need for natural resources to fuel its resurgent economy and the goal of exploring new trade opportunities has led New Delhi to re-engage with Africa in a more serious and consistent way. But in contrast with China, India's burgeoning ties with Africa have largely been led by the private sector. When Indian Prime Minister Manmohan Singh visited Ethiopia late in May for the second Afro-India summit his delegation was not just composed of state officials. Also joining him was a diverse group of some of India's most powerful businessmen, eager to tap new markets with high growth potential. A wide array of Indian companies, like telecoms giant Bharti Group and industry conglomerate Tata, have increasingly been focusing on African countries in recent years. These businesses are familiar with having to meet the needs of millions of poor customers under difficult conditions. 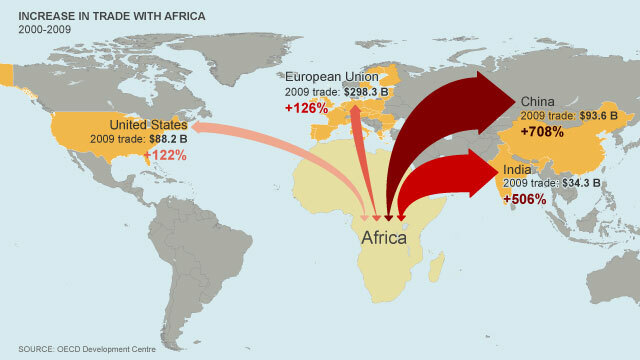 All these incentives given during the India-Africa Forum Summit 2011 are focused on politico-economic (areas). Time and again, Indian officials have denied that there is a rivalry with China, saying that Africa can benefit from both countries' presence. Yet Beijing's clear head start has led New Delhi to package itself as a partner who's putting the emphasis on building mutually beneficial ties. A striking example of India's new strategy has been the launch of the ambitious Pan-African e-Network, described as the biggest project for long-distance education and tele-medicine ever undertaken in Africa. The satellite and fiber-optic communication network, which has so far spread to 12 countries on the continent, is designed to provide connectivity between Indian institutions and 54 African countries, as well as facilitating easy video-conferencing among heads of states across Africa. At the recent India-Africa Forum Summit, Singh, who was on his third African visit since he took office in 2004, also announced a loans package of $5 billion to help countries on the continent achieve their development goals. India unveiled plans to build institutions such as the India-Africa Institute of Information Technology in Ghana and promote regional integration through infrastructure development. It also announced the creation of an India-Africa virtual university and promised more than 22,000 scholarships to African students. "All these incentives given during the India-Africa Forum Summit 2011 are focused on politico-economic (areas), says Suresh Kumar, head of African Studies at the University of Delhi. "All are market-oriented programs (and) will encourage the private investors of India further in Africa." Yet, some analysts believe that India still has a long way to go before it can close the gap with China. "It's decades away," says Vines. "The Indian capability, the infrastructure that they have, even diplomatically is far behind that of China." Kumar agrees that India is nowhere near closing the distance with Beijing but adds that New Delhi should be cautious about its foray in Africa. "When you compete at that big a scale with China (it) is going to create a lot of resentment in Africa," he says, "so I think one has to be careful not to push so hard as the Chinese are doing because if one does that, then you get the same resentment that China has in Africa."